The Force - the mysterious energy field used by the Jedi in Star Wars - has been discovered by researchers at the Cern laboratory. 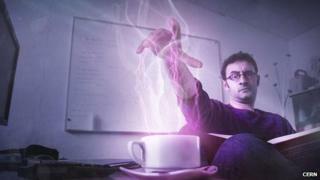 The European research centre announced its spoof discovery with pictures showing its scientists using The Force in everyday life. It was one of many April Fools jokes seen on websites around the world. Others included a selfie shoe, driverless pizza delivery and thought-powered web search. "The Force is what gives a particle physicist his powers," said Cern scientist Ben Kenobi of the University of Mos Eisley, Tatooine in a press release. Many scientists at the centre were already using The Force, said the release, to communicate over long distances, influence minds and for "lifting heavy things out of swamps". Microsoft used the background image for its main Bing search page to tout its April Fools joke in which it claimed the search system could read palms and minds to ensure people got the results they really wanted. Anyone could try thought-powered search by putting their right hand on a screen where the Bing homepage indicated. "The innovative new search function intelligently analyses the electrical signals transmitted through the hand to calculate the relevant search term," said the software firm. Many other firms and sites produced spoof announcements and products for 1 April. Smartphone maker Samsung produced a spoof page for a Blade edge version of its Galaxy smartphone that, it claimed, was designed for cooks. The limited edition handset incorporates a diamond-edged blade so the phone can also be used to chop food when it is not being used for calls, texts, or browsing the web. HTC joined in with fake product pages for the Re-Sok - the "world's first truly smart sock". The technology-enhanced footwear is engineered with GPS so pairs of socks can easily find each other and have an automatic hole warning system to alert owners when their intelligent footwear is running thin. For its April Fools parody, Motorola went to the trouble of making a lavish video showing two craftsmen producing selfie-sticks out of wood and leather. New York-based footwear maker Miz Mooz joined in and produced a pair of shoes that have smartphone docking ports in each toe so each one can be used to take selfies. Other parodies included cab-calling firm Hailo introducing piggy-back rides around cities; Domino's pizza introducing a driverless pizza delivery system using autonomous scooters; BMW making the ultimate rugby mouth guard and Sony making a wearable add-on for the PlayStation so players can take part in games when they are swimming.